A number of resellers have run dry of Apple Thunderbolt Display inventory, suggesting the 27-inch monitor may be due for an upgrade, perhaps with a thinner design that takes cues from the latest iMacs. As of Monday, major resellers Amazon, MacMall, and J&R are all out of stock of the Thunderbolt Display. Stock-outs are often one of the first signs of a forthcoming upgrade to Apple hardware. At the very least, the Thunderbolt Display is in need of an upgrade to its MagSafe cable. Apple currently ships a MagSafe to MagSafe 2 Converter with every Thunderbolt Display to allow compatibility with the latest MacBooks. But the Thunderbolt Display and its predecessor, the Cinema Display, have historically borrowed LCD technology from Apple's all-in-one iMac lineup. And the iMac was recently redesigned with a reengineered display panel that is thinner and reduces glare by 75 percent. Miroslav Djuric, chief information architect with the repair wizards at iFixit, noted to AppleInsider that the current-generation Thunderbolt display employs the same screen as the previous generation of 27-inch iMacs: an LG-built TFT active-matrix LCD panel. 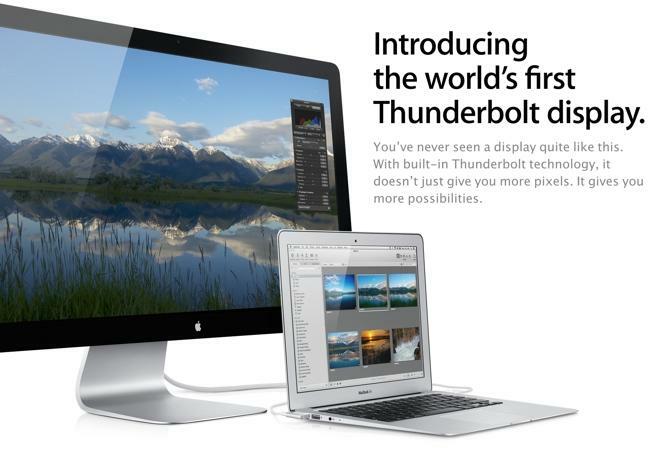 "Think of the Thunderbolt display as an iMac minus the computing hardware," Djuric explained. If that trend were to continue, an updated Thunderbolt Display would include a thinner LCD panel, and likely an overall thinner design. Apple's new 21.5-inch iMac actually has the same LCD as its predecessor, but the panel is 5 millimeters thinner, suggesting the same components have been squeezed into a smaller space. Apple also made its new iMacs thinner by fusing the LCD to the front glass. Djuric said he expects that design decision to also be utilized in a next-generation Apple Thunderbolt Display. However, if Apple is planning to bring the new iMac panel design to a refreshed Thunderbolt Display accessory, the new big-screen monitor's arrival may not be imminent because of potential production issues. Apple's new 27-inch iMac remains in short supply because of apparent production issues associated with the display. Until those issues are worked out, Apple may not have enough panels to also provide for a new 27-inch Thunderbolt Display. One report last week claimed that Apple and LG have only been able to produce about 100,000 27-inch iMacs per month. Apple's online store continues to advertise that new orders of the 27-inch iMac ship in three to four weeks. Analyst Ming-chi Kuo of KGI Securities was first to reveal in August that Apple was planning to use a new screen lamination process in its redesigned iMacs. Kuo also noted that manufacturing of the panels would be difficult. Another possible upgrade for the Thunderbolt Display could be its ports: The current model features three USB 2.0 ports, but Apple began offering faster USB 3.0 connectivity on its 2012 Macs, including the redesigned iMac. USB 3 offers transfer rates up to 5 Gbps, compared to just 480 Mbps for USB 2. The Apple Thunderbolt Display was released in July of 2011, making it the world's first display compatible with Apple's high-speed Thunderbolt I/O technology. 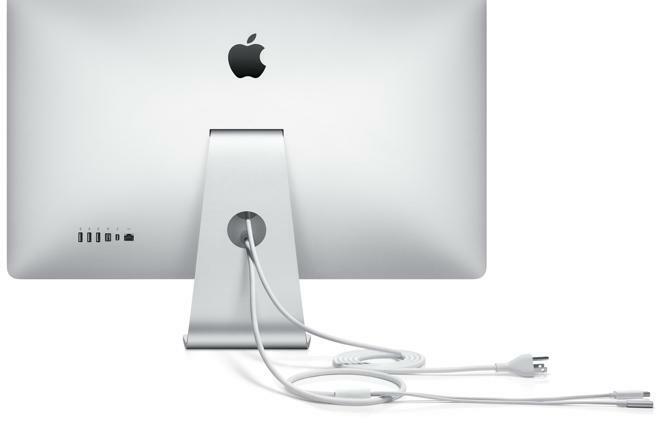 In addition to the aforementioned MagSafe charging cable and three USB 2.0 ports, the 27-inch screen includes a FaceTime HD video camera, 2.1 speaker system, one FireWire 800 port, a Gigabit Ethernet port, and a Thunderbolt port for daisy chaining up to five additional Thunderbolt devices. Apple also still continues to sell the previous-generation 27-inch LED Cinema Display for older Macs that have a Mini DisplayPort instead of the newer Thunderbolt port. Both the LED Cinema Display and the Thunderbolt Display are sold for $999.